As a mystery writer, I am fortunate to live in the Washington-Baltimore metropolitan area with its plethora of agencies involved in fighting crime. Yesterday, I spent the day at the U.S. Treasury Department, finding out how money is made and being amazed at the many intricate details that go into foiling counterfeiters. Even the paper used in printing money, a blend of cotton and linen fibers, is difficult for counterfeiters, who will generally stick to wood fibers. 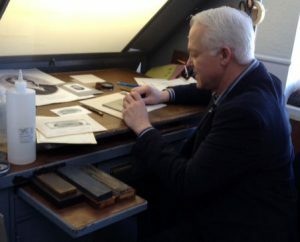 We took the standard tour for visitors, then were treated to a behind-the-scenes tour by a friend who works as an engraver there. He pointed out the painstaking care and high craftsmanship required to prepare the plates for printing the money. This includes incorporating many more details to foil counterfeiters. We also live close to the Cryptology Museum of the National Security Agency. This museum of codes and ciphers displays among its exhibits the famous Enigma Machine, used by the Germans in World War II. Visitors are encouraged to try their hand at code making with the machine. The United States seal that hung in the American Embassy in Moscow with a hidden and undetected listening device planted by the Russians is also on display. Questions? Ask away. The museum staff are usually retired NSA employees volunteering their time. Here’s an opportunity that might be available in your neighborhood. Our local police department is gearing up for another 12-week session of the Citizens Police Academy. Many police departments around the country hold similar academies. I took part in one of these a couple of years ago and recommend the experience even if you don’t write mysteries. The academy is an excellent place to learn the details of police work. The course I took included a ride-along with a police officer on patrol, a firearms demonstration at the range (I learned that police officers here use Glocks—usable detail), demonstrations of the police helicopter, K-9 dogs, emergency vehicles, and the Taser; talks on gangs, fraudulent IDs, drug enforcement, and use of force; and tours of the Crime Lab/Forensic Services, the Consolidated Dispatch Center and the Emergency Operations Center. When I’m describing an investigation, I want my mysteries to have the texture and flavor of the real thing. I’m not shy about asking for the correct details. In my 90s Club mysteries about 90-year-olds at Whisperwood Retirement Village, I contacted the West Virginia Sheriff’s Association to find out what exactly a sheriff’s uniform in West Virginia looked like. I also asked a firefighter friend exactly what the protocol was when paramedics were called to the scene of a beating victim. He gave me excellent detail which made the scene live. My next suspense novel, The Two-Sided Set-Up, incorporates the details of fraudulent IDs that I learned at the Citizens Police Academy.